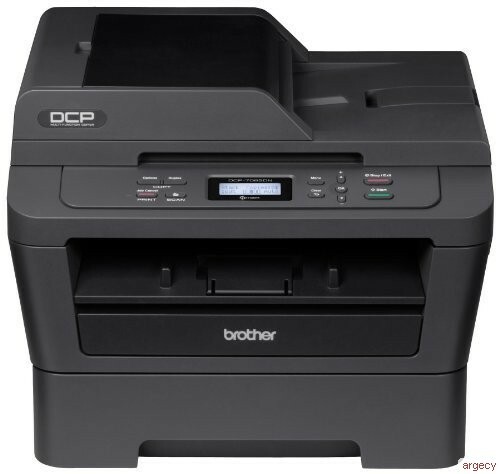 The Brother DCP-7060D is an affordable multi-function copier that is great for making quick copies or printing text-based documents. It features automatic duplex printing for producing professional two-sided output with ease. Its document glass provides convenient, walk-up copying and color scanning. Plus, its advanced capabilities allow you to scan documents to a file, image, E-mail or OCR. To help lower your operating costs, a high-yield replacement toner cartridge* is available. Fast printing and copying. Help improve your productivity with print and copy speeds of up to 24ppm and produce professional output at up to 2400 x 600 dpi. Easily produce two-sided output. Print professional-looking two-sided documents and booklets using the automatic duplex printing feature. Also, create two-sided output from one-sided originals when copying. This feature helps to reduce paper use and save money. Stand-alone copying. No PC required to make copies. Reduce/enlarge documents from 25-400% in 1% increments and help save paper with N-in-1 copying. Recommended Paper Brands Plain Paper: Xerox 4200DP 20 lb., Hammermill Laser Paper 24 lb. Sheet Weight - Paper Tray 16 - 28 lbs. Sheet Weight - Manual Feed 16 - 43 lbs. Unit Dimensions (W"xD"xH") 15.9" x 15.7" x 10.6"
Carton Dimensions (W"xD"xH") 20.7" x 20.1"x 17.3"
Unit Weight (lbs) 22.3 lbs. Carton Weight (lbs) 29.1 lbs. Nuance PaperPort 12SE supports MicrosoftSP3 or higher for WindowsXP and SP2 or higher for Vista, Windows 7 and Windows 8. All trademarks, brand and product names are property of their respective companies. Windows Vista and the Windows logo are trademarks of Microsoft United States and/or other countries. Mac OS and OS X are trademarks of Apple Inc.
"In-box" Consumables/Yield Approximate toner cartridge yield in accordance with ISO/IEC 19752 (letter/A4). Drum yield is approx., and may vary by type of use. For more information see www.brother.com/pageyield. Maximum Monthly Duty Cycle Maximum number of printed pages per month and can be used to compare designed durability between like Brother products. For maximum printer life, it is best to choose a printer with a duty cycle that far exceeds your print requirements. Standard Input Paper Capacity (sheets) Maximum capacity based on using 20 lb paper.